We welcome all visitors to experience Faith Lutheran Church. Our congregation is a young, vibrant, and growing family, and you are invited to experience all we have to offer. Worship is central to who we are and what we do as we gather to confess our sin, receive God’s forgiveness, worship through music and prayer, and be nurtured by God grace through word and sacrament. 8:15 Sunday Mornings during school year | 9:00 Memorial Day to Labor Day This service is led by piano, guitars, drums, and the Faith Singers. We hear the lectionary readings, children have time with Pastor Adam for the children’s sermon, and we celebrate Holy Communion every Sunday. During the school year, this service is indoors at 8:15 a.m. During the summer (from Memorial Day to Labor Day), this service is outdoors (weather permitting) at 9:00 a.m.
10:30 Sunday Mornings | This service is led by organ and follows traditional Lutheran liturgy and hymns. Holy Communion is celebrated every Sunday. When a month has five Sundays, we gather on that fifth Sunday at 9:30 a.m. for one combined service. This service typically involves a number of different musical choirs of Faith and the songs are led by a special orchestra comprised of members of Faith. Following the service, we often have a potluck to enjoy food and fellowship. For all services, you are welcome to dress casually, or put on your Sunday best. All are welcome. 9:30 Sunday Mornings | On a typical Sunday morning, people of all ages gather to grow in their faith during Sunday School, which occurs between our two worship services. Children ages three through 6th grade head to the large Sunday School room for an opening with very energetic and interactive music and prayer. They then engage in a lesson about a particular Bible story. We have developed our own three year curriculum which covers 108 significant stories from the Bible. Over the nine years a child participates in Sunday School, they ideally will have learned about each of these stories at least three times. Youth grades 7-9 participate in confirmation class. They dig deeper into the Old and New Testaments and learn about specific aspects of the Lutheran tradition such as the Sacrament of Baptism, the Sacrament of Holy Communion, The Apostles’ Creed, Martin Luther and the Protestant Reformation, and what it means to confess our faith, confirm our convictions, claim our call. Youth grades 10-12 engage in a High School Bible study. They cover topics relevant to their lives and interests, frequently using music and movie clips to stimulate discussion. Adults gather for an Adult Bible Study. We recently studied, “Making Sense of the Christian Faith” by David Lose, a book that helped us dig deeper into understanding theology, creation, original sin, atonement, the church, the Holy Spirit, and eschatology. We also studied, “The Lord is My Shepherd” by Rabbi Harold Kushner, a book that bring new life and meaning to the beloved 23rd Psalm. We meet at 8:00 am on Tuesday mornings at McDonald’s to share our highs and lows, read the gospel lesson for the upcoming Sunday, reflect and share about it, and pray together. There is always a light breakfast served and an empty chair at the table for others to join us. Faith encourages all of our families of all ages to engage in faith practices in the home. Specifically, we educate and empower families to participate in the “Faith 5.” It teaches five Faith Acts In The Home, including 1) sharing highs and lows, 2) reading a Bible verse, 3) talking about it, 4) praying together, and 5) blessing one another. Our Youth and Family ministry focuses on nurturing homes where faith is fostered and grown. 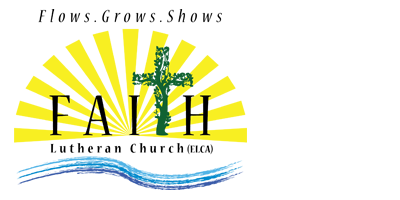 Click here to learn more about opportunities at Faith Lutheran to grow your faith and service. 217.245.8919 or click here to email us. Ample parking is available in the lots at the church. The building is accessible to those with disabilities, but there may be small disruptions during our current expansion project. Please call us if you have any concerns.